Walter was born January 29, 1929 and just celebrated his 90th birthday. He was raised and lived his entire life in the Garson area. He will be sadly missed and fondly remembered by his family; his wife of 63 years Myrtle (Ruchkall); his children Brenda Perreaux (Clint Flood), Sandra Stubbs (Mitch), and Doug Banash (Veronica Black); his grandsons Zane and Troy Stubbs. He was predeceased by his parents, Anne and Sebastian, sister Mae Skrupski and brother Ted. 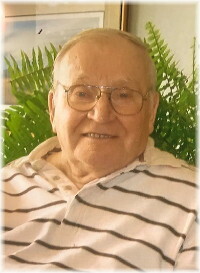 A hard-working man, Walter always took great pride in his home, yard, farm, and vehicles. Before becoming a full-time farmer, which was his passion, his work included Dominion Bridge and Gillis Quarries. Dad was always a very private person but when he spoke, we all listened. His dedicated work ethic was evident throughout his life and was instilled in his family to this day. A special thanks to East Gate Lodge and all staff on the Shamrock Unit for their thoughtful and caring ways towards dad and our family. A big hug to Sally in Recreation who always put a smile on our dad’s face. A funeral service will be held on Friday March 29, 2019 at 9:00 a.m. at the Garson Sacred Heart of Jesus Church with the interment to follow. Flowers are greatly declined; donations may be made to the East Gate Lodge Recreational Fund. My deepest Condolences to you Myrtle and your family upon Walters’ passing. He is at peace now . My thoughts and prayers are with you all. Our sinsere condolences Brenda, Clint and family. Our thoughts are with you during this time of reflection and love for your dad. Our thoughts and prayers are with you all on the loss of Walter. Myrtle and family – we are saddened to hear of the passing of Walter. May your fond memories carry you thru the difficult times. Sending prayers.